I have bought packaged roasted pumpkin seed squares in store before. They were delicious … but boy, were they expensive! $6 for a little packet – eek! So here is my version, without any processing or preserving nasties. 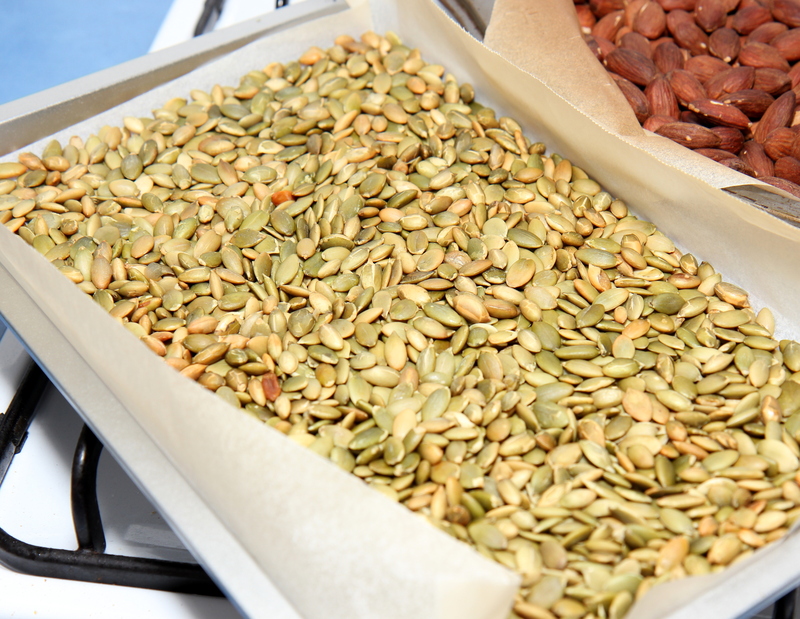 Dry roast the pumpkin seeds. I do this on a lined baking tray under the grill in my oven. Watch them very carefully. They only take a few minutes. Mix and turn the seeds and return them to the oven (a couple of times if necessary) so that they seeds are golden brown all over and puffing up. 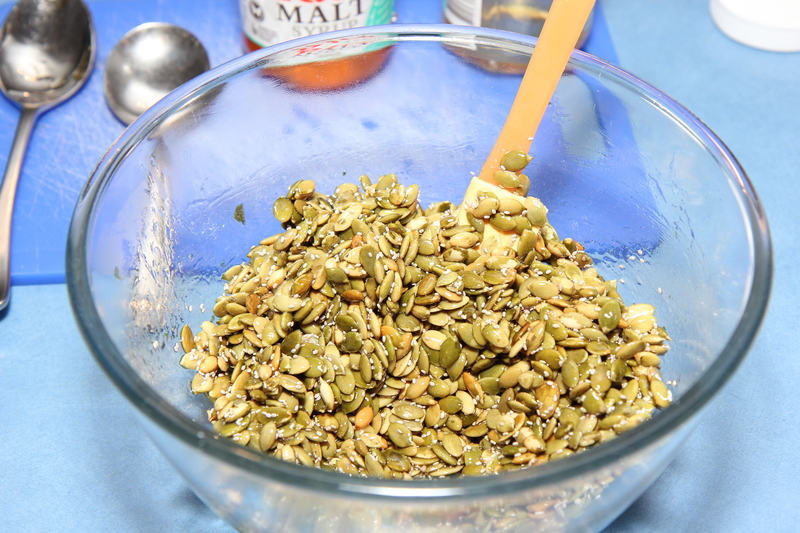 Place the rice malt syrup in a bowl, then while the pumpkin seeds are still hot, tip them into the syrup, also add the chia seeds and salt. Work quickly to mix the 4 ingredients well together – the heat from the seeds melts the syrup and makes it easy to work with. Place on a lined baking tray and cook in a pre-heated 150C oven for about 25 minutes. Allow to cool completely before cutting in to squares and storing in an air tight container in a cool place. Best to put a sheet of baking paper between layers when you store, otherwise they stick a bit to each other. You are right. The packaged version of this is so expensive! Oh no! That’s so frustrating!! I substituted the chia seeds for sesame seeds and it’s amazing. 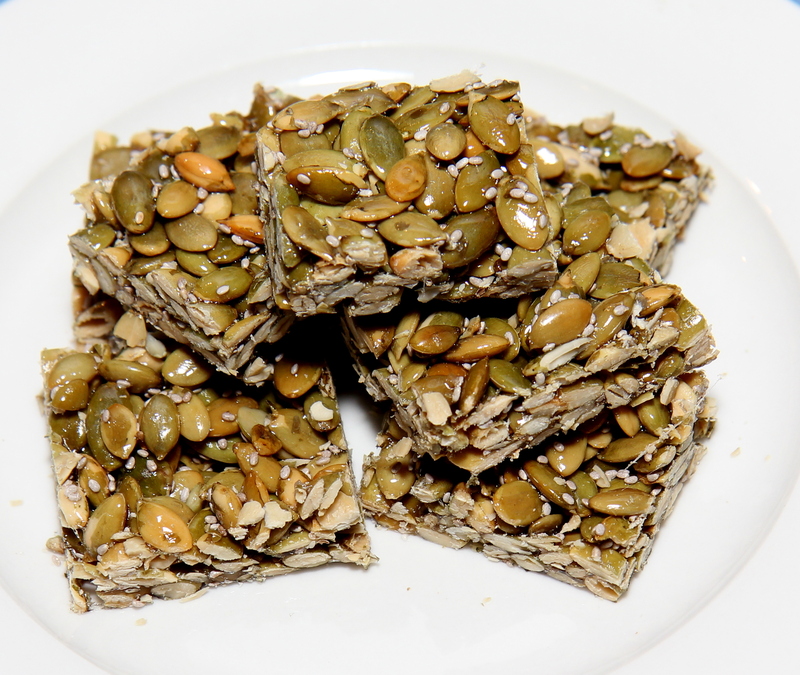 I also made a batch with added in sunflower seeds and cranberries. Delicious.